For most of my third trimester I worked out 4-5 times a week. I definitely slowed down from what I was doing during the second trimester once I hit about 30-32 weeks and my routine consisted of barre twice a week, walking (either outside or on the treadmill) for low impact cardio twice a week, and then trying to squeeze in a prenatal Beachbody on Demand workout once a week when I could for a fifth workout. Around the end of my thirty-fourth week I kind of felt like I hit a wall and dropped down to three workouts a week. This was when I started having contractions and it was like a switch flipped and overnight I stopped feeling well the majority of the time and those end of pregnancy symptoms started making themselves known. I continued to go to barre twice a week most weeks and either walking or a thirty minute prenatal workout on the third day. Part of cutting back at this point also had to do with my schedule and having more appointments and other tasks to get done during my free time while not having the energy to tack a workout on after Madeline’s bedtime in the evenings. In Charlotte I attend The Bar Method for my barre classes and I have really enjoyed them throughout my pregnancy. They are such a great low-impact workout that has been safe to do all the way through. I’ve tried most of the barre studios in town at some point or another during the time we have lived here and I have to say this one is hands down my favorite in terms of instructor quality, friendliness and community at the studio, and the overall workout, too. It also really helped that two of the instructors I took classes with were also pregnant and that it truly is a “method” so everyone was very well trained on safe modifications for the different stages of pregnancy, which left no “guess work” for me. This trimester especially I have also been so thankful for the prenatal workouts on Beachbody on Demand as I’ve had to modify more and more throughout. It seemed that each week there was something new that felt uncomfortable so it was nice to be able to get a safe but effective workout at home. 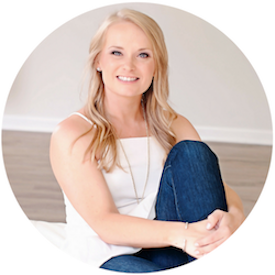 If you are looking for a workout to do at home during pregnancy or after (I loved BOD postpartum after Madeline was born, too), I can't recommend this enough and have a great coach to recommend. After the last barre class I already have scheduled I am taking a break for however much longer this pregnancy lasts - whether it be days or weeks, but I will share what I choose to do postpartum when that time comes. All I can say so far is that it will most definitely come sooner than it did last time! Symptoms: lower back pain, lots of Braxton Hicks contractions, a little bit of swelling in my fingers and feet some days, and exhaustion! Also nesting. So much nesting. I have reorganized almost all of the closets in my house, the pantry and fridge, and the kitchen cabinets. And my car. Cravings: I am not really having any cravings but I am either not hungry at all or completely famished. And if I am start to feel hungry I am about five minutes away from becoming very hangry! Eating lately: Three meals and a snack. I’m currently loving a Shakeology for breakfast with half a toasted English muffin with peanut butter. I’m liking salads or soups for lunch and have been eating larger portions at dinner than usual! I am definitely most hungry at night. I’m kind of over enjoying any sweets at this point but do want a snack of some sort in mid-morning. It’s usually an apple or Siggi’s coconut yogurt. Baby’s movement: Baby is head down and ummm...engaged and moving around lots! Wearing lately: Entirely maternity clothes and mostly items from my pregnancy with Madeline. I love pairing my maternity leggings and jeans with simple maternity tees and soft cardigans now that it is cold. Sleep: it’s totally hit or miss! Now that he is really low I have to pee all the time but there are some nights I sleep so hard and soundly that I wake up surprised. I’ve started sneaking in an afternoon nap a few times a week over the past week for 30 minutes or so and that has been awesome! Stretch marks: Not yet! Still lathering up with my oil and belly butter. Belly button: it is in but getting pretty close to popping out! Someone told me during my first pregnancy that it is like a turkey timer. Haha! So we will see when it pops! Highs/lows: the highs have just been finishing up all the projects. I reorganized the playroom and a few other closets in our house that had absolutely nothing to do with baby but it was just nice to have it off my list. We also have our handyman here for a few days this week just knocking some things off our list that were bothering me but we never made time to address like painting our stairway bannister and some trim, repairing a loose handle to the tub and a sticky door, and hanging Corey’s basketball hoop. Oh, and installing crown molding in our secondary bedrooms. Because apparently I am completely crazy and decided they just had to have it three weeks before my due date. Another high was having our family in town this past weekend. We hosted six guests for a little mock Thanksgiving. It was so nice to spend time with everyone. We made pierogies because that side of my husband’s family is Polish and always did them for Thanksgiving, grilled steak, and just enjoyed the time together. I’m so glad we decided to do this early, though, instead of on the actual day of Thanksgiving because it was so fun (especially seeing Madeline with her cousins) but also very exhausting! The only real low I have is some anxiety at night when Corey is traveling. I had two episodes of regular contractions but they were not causing me to dilate or progress in any way. Since then I’ve just been having sporadic Braxton Hicks but whenever I have them at night when he is gone for work I get super anxious knowing he likely couldn’t make it back in time. We have a plan in place for in case I go early and he can’t be here but it is still really stressful for me. I really don’t want him to miss the birth or to just not have him there with me for the support, even though my mom would be there in the event that that happens. This week is jam packed and we are enjoying a little staycation this weekend since we didn’t get to travel for a babymoon and to celebrate my birthday. 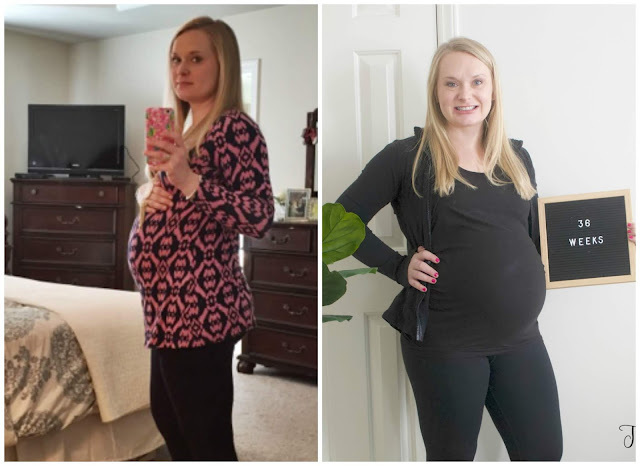 Here is a little side by side of me at 36 weeks with Baby Boy and with Madeline. You can check out that bumpdate here. Madeline was born at 38 weeks 3 days. Anyone have any guesses when this baby will make his debut? You are amazing! I'm so impressed that you've kept up your fitness. While I'm no expert, I think you will be so happy you did that during labor and bouncing back after baby! For a 140 pound female, this is 70 grams of carbohydrates pre workout or 280 grams of carbohydrates 4 hours pre workout.Russell Westbrook supplements Now, this may sound like a lot to you! Trust me, it's not!